The time to turn to God in prayer is before trials strike. Remembering to pray when you’re in trouble is like the spoiled child that never calls home until they need money. God wants to be a part of our daily lives, not our sugar daddy. Daniel knew this. Day after day after day, three times a day, from since he’d come into Babylon he prayed kneeling in his window for all to see. It was a well-known fact amount the government of King Nebuchadnezzar’s and of his son Belshazzar’s rule as well. As Darius overtook the throne, and brought on a new government, Daniel was promoted to be one of three governors over the entire kingdom. Daniel had found favor in Darius’ sight, and Darius believed in the God of Daniel. But the other governors and officials did not. They sat forth to create a law whereby Daniel would be entrapped and go to the Lion’s den, to be eaten by the Lion for praying to God. Daniel’s testimony told them that he was faithful to his God. So the rule was that no man could pray or petition anyone or any god except the king for 30 days. The rule was put into place for only 30 days. They knew Daniel would never go even 30 days without talking to his God. And the day the law was put into place, Daniel heard it, and he went home. Did he hide under his bed and pray? Did he quietly kneel in a corner? Did he step into a prayer closet and close the door? Nope! He was in his upstairs room kneeling at the window again! He did not fear men because he knew what his God could do. He’d already saved him and his friends from a fiery furnace. This was just another hill to climb, another obstacle that would turn to grace. 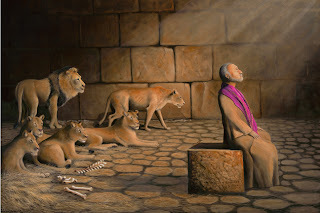 Daniel’s God had been made famous by Daniel’s life and testimony. 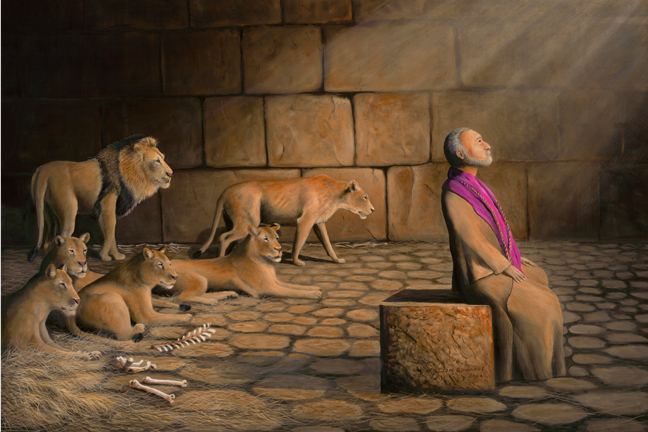 Even as the king was putting Daniel into the lion’s den, he proclaimed the faithfulness of Daniel’s God. Are our lives lived in such a way that God would receive glory from our trials even before they start? Have we given Him glory over past trials so that all around us know His faithfulness? We can offer so very little to a God who knows all, has all, and controls all. What we can offer is praise for what He has done – give him glory. What we can do is what Daniel did - serve continually. If we were as faithful to God as God is to us, the whole world would believe in Him.